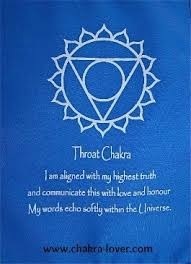 The Fifth Chakra is also called the Throat Chakra. It’s name in Sanskrit is Visuddha, which means *pure or purification*. It is located right at your throat. This chakra is all about TRUTH. 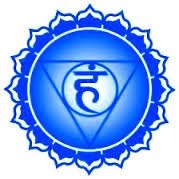 The color of this chakra is blue; it’s element is the Ether/Spirit and it is considered a “masculine” chakra. When this chakra is balanced and functioning properly, you are able to fully communicate with others; you are able to also comprehend when others speak. You are confident, clear and focused. You may find yourself being an inspiration to others, being able to educate and elevate through speaking the truth, honestly and openly. Conversely, if this chakra is unbalanced, you may find yourself unwilling or incapable of speaking the truth, as you are unable to connect to it. You may be afraid of communicating and unable to accurately express yourself. is as if your are pumping your belly. Any exercise where you put a stretch on the throat will strengthen this chakra. You can try standing, bringing your hands straight up over your head, clasping the palms together. Inhale and begin to gently do a back bend, stretching the throat. Exhale the breath and you come back to the standing straight position. Do this for at least 3 minutes, with powerful breath. After the meditation, continue to lie down on the floor and relax for at least five minutes or alternately, sit quietly with a relaxed breath. Stretch your arms up toward to ceiling several times before moving. Until next month, when we continue with the Sixth Chakra, I wish you peace, joy and happiness.